Do you experience product damage? If you are sending fragile freight through a pallet network or supply chain then you will probably experience some level of product damage. Increasingly, companies are using pallet network operations to move their goods due to cost benefits and efficiencies. However, there is a trade off between reduced cost and risk of damaged freight. In order to maximise these efficiencies, freight is handled multiple times, travelling through at least one transit hub, increasing the risk of pallet damage to your product. Palletcap has been a key supplier for many years, we have found both their product and service exceptional. The introduction of “Palletcap” to our pallets reduced damage through top stacking significantly. Product crushing is typically due to double stacking of pallets as hub operations and network members attempt to maximise the space on the trunk and delivery vehicles. If your product is fragile then the likelihood is that you will sustain a percentage of product damage from crushing which will increase your costs and result in a drop in service levels to your customers. Over the years, Palletcap has saved us thousands in damages and lost business. I was sceptical at first but using the Palletcaps has proven to be one of the best investments we have made as a company. General Manager | MTH Express Services Ltd.
Our award winning Palletcap is a unique product that guarantees to stop your pallet of goods being stacked on and to help prevent damages. 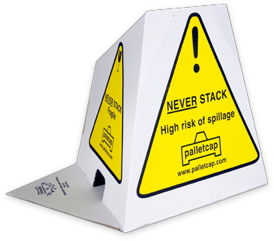 Palletcaps act as a visual warning sign to fork lift truck drivers that can’t be missed unlike labels. The message to the operative is clear, DO NOT STACK on this pallet! 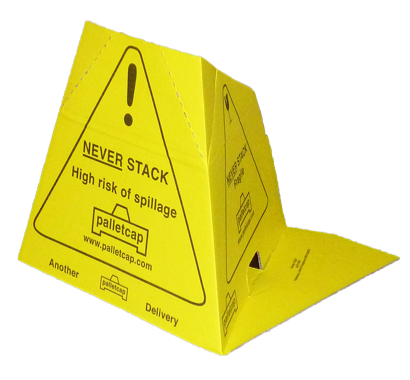 Save money and reduce the headaches by using Palletcaps. We can deliver them to you the next working day so you can start protecting your product immediately. The benefits will certainly outweigh the cost as Palletcap will reduce; Damage levels, Returns costs, Claim levels, Customer Complaints and Damage cost. 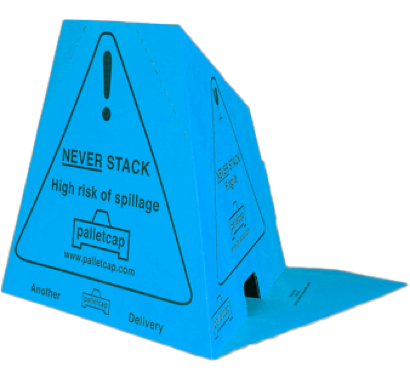 The pallet cap comes as a flat pack piece of pre-cut card that is easy to quickly fold and make into a 3D pyramid and attached to your product. You can find out more information on our FAQ page. Why not try our protective cap by requesting a sample or contact us, and one of our friendly team members can answer any questions or post you a sample pack and you can see the benefits for yourself. Join our group of customers that are saving up to £275,000 per year in damages and lost business.